I feel like I have finally recovered from the holidays at home. However, there will still be no ham on my weekly menu for quite some time! The Diva on a Diet of Beach Eats adapted Rachael's recipe for Stuffed Cabbage Soup. Columbus Foodie adapted Rach's recipe for Mighty Migas. Zeemaid of In the Mommy Trenches reviewed Rachael's Bubble and Brown casserole dish. Shelley of Shelley Bakes made Sausage, Potato and Cabbage Stew. 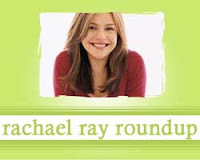 Tracy Burnett of Cooking My Way to Happiness with Rachael Ray had an exciting experience this week! Mary Ann Kauchak of the Stafford County Sun adapted Rachael's recipe for Summer Corn and Chipotle Chowder. LG of iGriza was not impressed with Rachael's recipe for Pico de Gallo Pilaf and Margarita Fish Soft Tacos. Suz of Day by Day with Suz made a bunch of Rachael Ray recipes this week.